October is a maddeningly manic month for weather, with everything from 80s to blizzards and subzero lows across Minnesota. The transition from summer to winter is a little like the first dance at a high school prom: awkward. Hurricane Michael was the 12th billion-dollar weather/climate disaster so far in 2018. According to NOAA: "These events included 1 drought event, 6 severe storm events, 1 tropical cyclone event, 1 wildfire event, and 2 winter storm events - factoring Hurricane Michael the preliminary USA death toll is 134, and may rise higher. The pattern won't favor major storms (of any flavor) into early November - just a series of Alberta Clippers dragging occasional bursts of chilly air into the Upper Midwest. Saturday will feel like November, with windblown snow flurries and a wind chill dipping into the 20s at times. Sunday looks nicer. Which makes it all the more imperative to take a long pause and make a point of gawking at a kaleidoscope of color outside your window today with highs in the 60s. Models show 50s for much of next week; close to average. Lukewarm Reprieve. Today will probably be the mildest day of the week with most of the state experiencing highs in the 60s. Map: Twin Cities National Weather Service. Chilly Start to November? Confidence levels are low (they often are 2 weeks out), because yesterday's GFS solution hinted at a milder, zonal, west-to-east wind flow aloft for much of North America in late October and early November. The latest solution looks cooler - not bitter, but if the map above verifies temperatures on Halloween may be a few degrees cooler than average. Tornadoes Are Spinning Up Farther East in U.S. and Scientists Don't Know Why. Fluke or a trend? NBC News has the story: "Over the past few decades tornadoes have been shifting — decreasing in Oklahoma, Texas and Kansas but spinning up more in states along the Mississippi River and farther east, a new study shows. Scientists aren't quite certain why. Tornado activity is increasing most in Mississippi, Arkansas, Tennessee, Louisiana, Alabama, Kentucky, Missouri, Illinois, Indiana, Wisconsin, Iowa and parts of Ohio and Michigan, according to a study in Wednesday's journal Climate and Atmospheric Science. There has been a slight decrease in the Great Plains, with the biggest drop in central and eastern Texas. Even with the decline, Texas still gets the most tornadoes of any state..."
Hurricane Michael's Remarkable, Terrifying Run. A story at The Atlantic has perspective on what just hit the Florida Panhandle: "...Even inland, the winds—which blew as fast as those inside a tornado—collapsed churches and gas stations, knocked 18-wheelers on their sides, and stripped dense woodland entirely of its greenery, leaving behind only clusters of huddled, naked trunks. “Students in tropical-meteorology classes are going to be talking about this storm for 20 years,” says Colin Zarzycki, a tropical-cyclone scientist at the National Center for Atmospheric Research. From the moment it made landfall, Michael became one of the four strongest hurricanes in history to hit the continental United States, according to the weather historian Phil Klotzbach..."
Photo credit: "The destruction wrought by Hurricane Michael in Mexico Beach, Florida." SevereStudios.com / AP. Hurricane Michael By The Numbers. Some amazing stats and perspective from Capital Weather Gang; here's an excerpt: "...919 millibars: If being the fourth-strongest hurricane at landfall for winds isn’t enough, Michael attained an even higher status for central pressure: 919 millibars at landfall is the third-most intense on record, behind only Labor Day and Camille. Ear popping...10-plus feet: Mexico Beach, to the east of Panama City on the Florida Panhandle, was more or less Ground Zero for Michael. 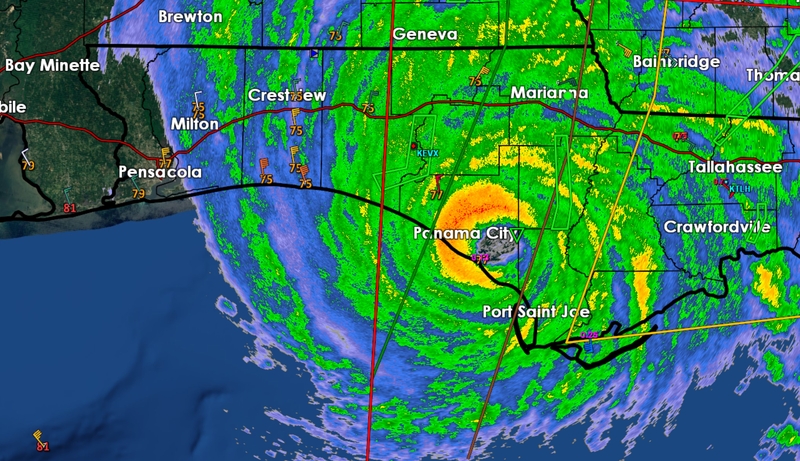 In the “right front quadrant” of the eyewall, the strongest part of the storm, the area was decimated by wind and water. The storm surge rose to at least 10 feet here, high enough to wash entire homes and buildings away..."
Photo credit: "The whole town is gone:' Hurricane Michael wipes out Florida coastal community." (Alice Li, Jorge Ribas/The Washington Post. How Hurricane Michael Got So Strong, So Quickly. Andrew Freedman provides more perspective in a post at Axios: "...Hurricane Michael faced an array of obstacles when it first became a hurricane off the western end of Cuba on Sunday night. One key impediment on its power was wind shear, which threatened to topple its thunderstorms over as they attempted to encircle the storm center. There was also some dry air that got sucked into the storm, disrupting it for a time. But in a matter of a few hours on Tuesday night, Michael transformed from a potent storm into a nightmare scenario, and just kept getting worse. The likely cause is the fact that the rest of the ingredients needed for rapid intensification were there — plenty of unusually warm water, moist air, and an upper level wind pattern over the northeast Gulf of Mexico that was particularly conducive to evacuating the air the storm vaulted upwards, like venting the exhaust from a giant engine. Still, the pace of intensification that Hurricane Michael went through is startling, with the winds jumping from 110 mph to 155 mph in 24 hours, and the air pressure dropping 46 millibars during that period..."
Graphic credit: National Hurricane Center; Chart: Harry Stevens/Axios. Dangerous Rapidly Intensifying Landfalling Hurricanes Like Michael and Harvey May Grow More Common. Dr. Jeff Masters wrote a post for Weather Underground that caught my eye. Here's an excerpt: "...Dr. Emanuel used a computer model that generated a set of 22,000 landfalling U.S. hurricanes during the recent climate period of 1979 - 2005, then compared their intensification rates to a similar set of hurricanes generated in the climate expected at the end of the 21st century. For the future climate, he assumed a business-as-usual approach to climate change—the path we are currently on. The analysis found that the odds of a hurricane intensifying by 70 mph or greater in the 24 hours just before landfall were about once every 100 years in the climate of the late 20th century. But in the climate of the year 2100, these odds increased to once every 5 - 10 years. What’s more, 24-hour pre-landfall intensifications of 115 mph or more—which were essentially nonexistent in the late 20th Century climate—occurred as often as once every 100 years by the year 2100. The major metropolitan areas most at risk for extreme intensification rates just before landfall included Houston, New Orleans, Tampa/St. Petersburg, and Miami. 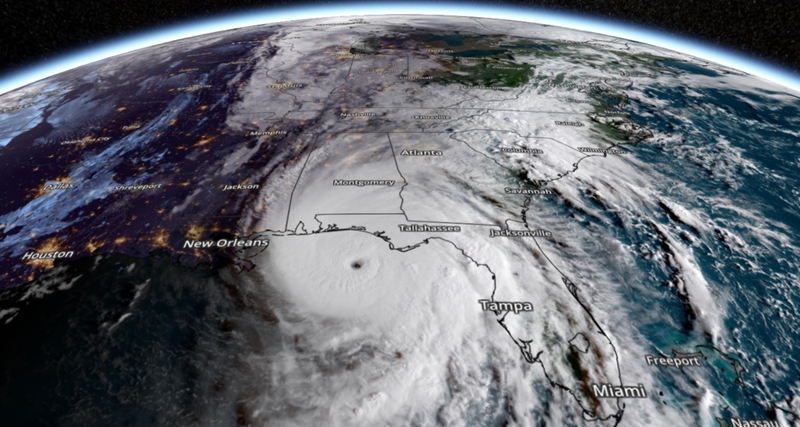 In an email, Dr. Emanuel said: “My own work shows that rates of intensification increase more rapidly than intensity itself as the climate warms, so that rapidly intensifying storms like Michael may be expected to become more common..."
October 10 image of Hurricane Michael: NOAA and AerisWeather. Cost From Hurricane Damage to Rise Alongside Frequency, Intensity. A few statistics from a post at TheHill: "...Economists say that increased intensity is leading to costlier damage. “When one tries to quantify the damages, in many ways it’s the extremes that matter the most,” said Gernot Wagner, a research associate at Harvard University’s School of Engineering and Applied Sciences. “Several regular-sized storms hitting in a row is typically not as bad as having one extreme storm hitting. The fact that the extremes go up, that increases costs even more so than if the averages would move up.” In the case of the most recent hurricanes to hit the U.S., it’s both increased intensity and frequency. The National Oceanic and Atmospheric Administration this month estimated that so far this year there have been 11 weather or climate disaster events that caused more than $1 billion in damage. 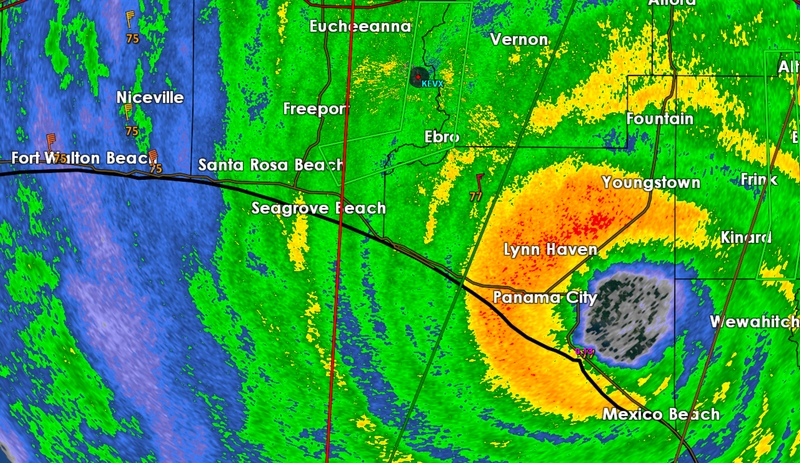 Hurricane Michael will likely expand that list to 12..."
October 10 radar image from Hurricane Michael: NOAA and GR2Analyst. Reporting Live from Hurricanes: Unsafe and Over the Top or "Dangerous But Necessary?" Hey, it's television. Marketing 101. Here's an excerpt from Capital Weather Gang: "...Television stations will often do anything for what seems like the money shot. In an era where social media is drawing more attention and viewership dwindles, gaining that competitive edge oftentimes pushes networks to up the ante. Some argue that it’s a necessary evil — viewers are much more likely to take action if they see the power of the elements firsthand. After all, a live camera on a tornado is much more compelling than a radar presentation resembling a “bucket of spilled paint,” according to Alabama meteorologist James Spann. Others feel that compromising safety is never acceptable and that stations should be able to provide a coercive narrative without the risky gamble of being at ground zero. After all, is it appropriate to show what not to do? It’s a controversial debate that has meteorologists split right down the middle..."
Photo credit: "Television reporters stand watching as Hurricane Michael makes landfall as a Category 4 storm Wednesday in Panama City Beach, Fla." (Jabin Botsford/The Washington Post). Among the Ruins of Mexico Beach Stands One House, Built for "The Big One". Fun with concrete reinforced steel, but (given a big enough budget) it is possible to build a hurricane-proof beachfront home. Here's an excerpt from The New York Times: "...Dr. Lackey said he and Mr. King, who jointly own the Mexico Beach house, did not even refer to the minimum wind resistance required in Bay County. They built the sand palace to withstand 250 mile-an-hour winds. The house was fashioned from poured concrete, reinforced by steel cables and rebar, with additional concrete bolstering the corners of the house. The space under the roof was minimized so that wind could not sneak in underneath and lift it off. The home’s elevation, on high pilings, was meant to keep it above the surge of seawater that usually accompanies powerful hurricanes..."
Photo credit: "The elevated house that the owners call the Sand Palace, on 36th Street in Mexico Beach, Fla., came through Hurricane Michael almost unscathed." CreditCreditJohnny Milano for The New York Times. These Homes Can Withstand Hurricane, Floods and Fires. A story at CNN Business caught my eye: "...Ramsey looked at a natural coastline near the building site. "The wind and tides have shaped it into something that isn't just a raceway for water," says Ramsey. "Something that takes water through it and the water and land interact together." He approached the house as a hydro-landscape intervention, shaping the land and terrain in a way that was responsive to the way Hurricane Sandy came through six years ago — where the water flowed and how it traveled. With a concrete retaining wall under the house and huge walls of ballistic glass, the house is tough. But the scrubby dune landscape with beach grass and plantings push the house up above the high water mark, providing a way for water to come in and go out naturally..."
Photo credit: "This beachfront residential property on the coast of New Jersey was built by RAAD Studio to withstand storms." The Case for Making Cities Out of Wood. Say what? There may be a sustainable, low-carbon way forward, according to a story at Nautilus: "...The idea of future wood cities has been hanging around for at least a few years. In 2014, for example, the Boston Globe wondered, “Will cities of the future be built of wood?” The rise of both human population and global temperature prompted much of the interest in the sustainability of city-scale timber construction. By 2050, we will number almost 10 billion; and since two-thirds of us will be city dwelling—up from just over half in 2014—cities will have to grow. It’d be ideal to do that without curtailing efforts to combat climate change; it wouldn’t be helpful, for instance, to keep extracting and transporting the raw materials needed to build steel and concrete structures, which are more expensive and have large carbon footprints. Wood, on the other hand, is “a plentiful resource that grows back relatively quickly, and even pulls carbon out of the atmosphere as it does,” the Globe noted..."
Photo credit: "An Alphabet subsidiary is planning to build a futuristic neighborhood, not out of concrete and steel, but wood—and wood is looking good. Photograph by Daici Ano / Flickr. Rolls Royce Will Never Make a Hybrid Car: CEO. But they have plans for all-electric, according to an article at Bloomberg: "...There is an electric future for Rolls-Royce. We have not made our plan about what comes first, and what comes when, but we know that we will go full electric. We will not do hybrids or whatever. Our proposition is full electric. It will come in the next decade, step by step by step. But I can also tell you we will stick with our beloved 12-cylinder as long as we can..."
Photo credit: "Torsten Müller-Otvös." Photographer: Luke MacGregor/Bloomberg. U.S. Weapons Systems Are Easy Cyberattack Targets, New Report Finds. Here's the intro to a harrowing story at WIRED.com: "The first step in solving any problem is admitting there is one. 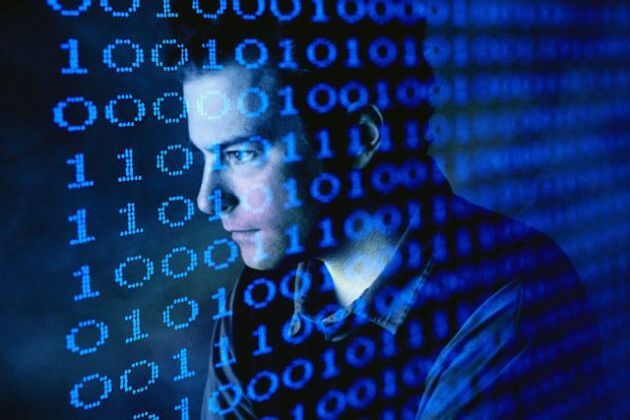 But a new report from the US Government Accountability Office finds that the Department of Defense remains in denial about cybersecurity threats to its weapons systems. Specifically, the report concludes that almost all weapons that the DOD tested between 2012 and 2017 have “mission critical” cyber vulnerabilities. “Using relatively simple tools and techniques, testers were able to take control of systems and largely operate undetected, due in part to basic issues such as poor password management and unencrypted communications,” the report states. And yet, perhaps more alarmingly, the officials who oversee those systems appeared dismissive of the results..."
Apple's Jony Ive on the Unpredictable Consequences of Innovation. Is the world too connected? With all these screens and digital connections are we distracting ourselves to death, at the detriment of face-to-face, social interaction that binds us all together? Here's an excerpt from WIRED.com: "...But to hear Ive tell it, helping users manage their time is a small part of the challenge Apple and other technology companies face. "What I'm more concerned about," said Ive, is preserving the interpersonal benefits of person-to-person interaction. "The more you remove people, the more technology can become transactional," he said. Ive says the work Apple has been doing on emoji and messaging are meant to "restore some humanity to the way we connect." In his remarks, Ive turned again and again to the theme of human connection. It's important to Ive not just professionally (it’s central, for example, to his team's vision for the future of Apple's retail experience), but personally. "I moved to the US in 1992 for two reasons: I loved Apple and I loved the US." 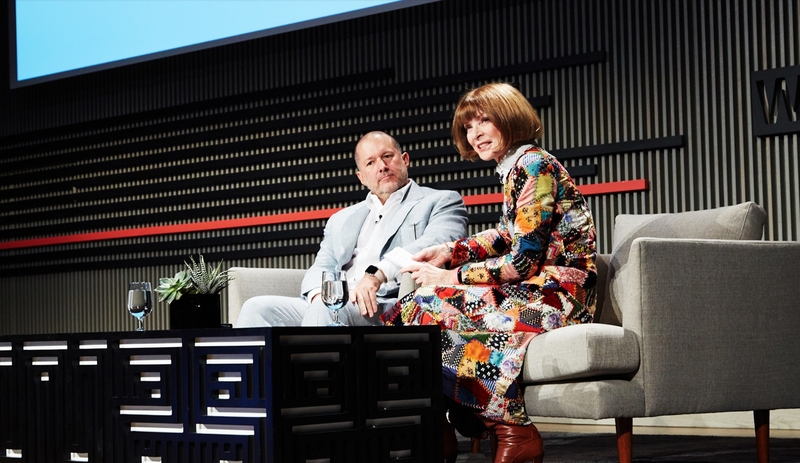 At the time, he said, "optimism was tangible and material"—particularly in Silicon Valley..."
Photo credit: "First there were iPhones, and now there's iPhone addiction," Anna Wintour said to Jony Ive onstage at the WIRED25 summit. "How do you feel about that? Is the world too connected?" Amy Lombard. 50 F. high in the Twin Cities on Wednesday. 58 F. average high on October 17. 73 F. high on October 17, 2017. October 18, 1950: Record high temperatures are set across the area as highs reached the mid to upper 80s. Minneapolis and Farmington saw highs of 87 degrees Fahrenheit, while Albert Lea reached 86 degrees. October 18, 1916: A blizzard impacts Minnesota. A sharp temperature drop begins as well; Hallock drops from the 60s to 2 above by the 20th. Warmer Fall Nights. 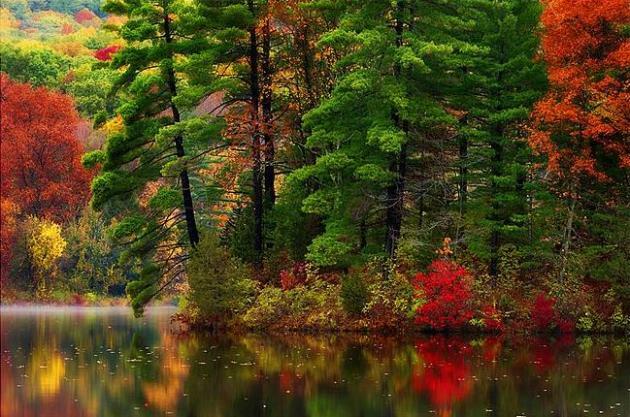 Climate Central has a post about the trends: "Warming fall nights mean more than just a delay in pulling out those comfortable sweaters and drinking hot apple cider. The lack of cool nights effectively lengthens the summer, as the first frost of the year also comes later. While warm-weather fans may celebrate, this also means that disease-carrying pests like mosquitoes and ticks will persist longer before dying off in the winter. Nationally, the long-term warming trend has lengthened the growing season by two weeks compared to the beginning of the 20th century. The allergy season is also getting longer, with ragweed pollens not disappearing until the first freeze of the fall. Each ragweed plant can produce up to one billion pollen grains, which can cause sneezing, itchy eyes, and worsening asthma conditions. Hospital visits related to asthma spike during periods with high pollen concentrations..."
Photo credit: "President Trump held a press conference as Hurricane Michael made landfall last week." Jonathan Ernst / Reuters. Trouble Brewing: Climate Change to Cause "Dramatic" Beer Shortages. Media hype? I hope so. Here's a clip from The Guardian: "Trouble is brewing for the world’s beer drinkers, with climate change set to cause “dramatic” price spikes and supply shortages, according to new research. Extreme heatwaves and droughts will increasingly damage the global barley crop, meaning a common ingredient of the world’s favourite alcoholic beverage will become scarcer. Key brewing nations are forecast to be among the worst hit, including Belgium, the Czech Republic and Ireland. The researchers said that compared with life-threatening impacts of global warming such as the floods and storms faced by millions, a beer shortage may seem relatively unimportant. But they said it would affect the quality of life of many people..."
IPCC Report: Going From Climate Theory to Reality. Here's a link to an interview I gave to Ali Velshi at MSNBC Sunday morning from Washington D.C.: "The Hurricane Michael devastation is highlighting climate change, with meteorologist Paul Douglas telling Ali Velshi, ‘We've had four Category 4 or stronger hurricane strikes in the U.S. in the last 14 months,’ because of, ‘additional warming from greenhouse gases." Is Extreme Weather Really Becoming More Common? Some perspective from SciLine: "...The scientific consensus is “yes,” though details vary from region to region around the globe. Among the documented increases:Since 1991, the number of U.S. extreme downpours has increased by more than 30 percent compared to the 1901 to 1960 average, contributing to increased flooding. Extreme heat waves and droughts in Europe have more than doubled since 1980. Atlantic hurricane frequency, intensity (Category 4 and 5 storms) and duration have increased substantially since the early 1980s; North Atlantic tropical storm frequency over the years 2000 to 2013 increased by about 50 percent compared to the long-term (1966 to 2009) average..."
Photo credit: "The aftermath of Hurricane Florence in Trenton, N.C., on Sept. 20, 2018." Photographer: Alex Wroblewski/Bloomberg. Climate Change is Transforming Business. Here's a clip from Forbes: "...Some of the impacts on business are indirect, like changes in how insurance firms assess natural disaster risk, while others are clearly direct, such as Coca-Cola’s fear of water scarcity and IKEA’s fear of deforestation. These more immediate physical impacts are leading companies to invest in new processes and technologies to mitigate risk. There are also less intuitive impacts related to the transition to a carbon-free economy, as well as new trends in how customers, investors, business partners, and regulators make decisions. For example, customers are rewarding companies for sustainability efforts, governments and partners are enforcing goals of the Paris Agreement, and investors are demanding climate-risk disclosure..."
Exxon Mobil Pleges $1 Million to Campaign to Promote Carbon Tax. This just in: pigs are flying, but at least give credit to Exxon for evolving their position on a rapidly changing climate. They want a signal in the market, because the last thing (any) business wants is uncertainty. Here's an excerpt from CNBC.com: "Exxon Mobil will donate $1 million to a campaign promoting a tax to curb emissions of planet-warming carbon dioxide to U.S. lawmakers and the American public. With the commitment, the world's largest publicly traded oil company is throwing its financial support behind Americans for Carbon Dividends, an organization tasked with lobbying for a carbon tax plan developed by Republican statesmen James Baker III and George Shultz. Exxon's support comes at a time when U.S. lawmakers remain at an impasse over putting a price on greenhouse gas emissions, with many Republicans opposed to a carbon tax or cap-and-trade system..."
Shell Boss Says Mass Reforestation Needed to Limit Temperature Rises to 1.5C. The Guardian reports; here's an excerpt: "The boss of Shell has said a huge tree-planting project the size of the Amazon rainforest would be needed to meet a tougher global warming target, as he argued more renewable energy alone would not be enough. Ben van Beurden said it would be a major challenge to limit temperature rises to 1.5C (equivalent to a rise of 2.7F), which a landmark report from the UN’s climate science panel has said will be necessary to avoid dangerous warming. “You can get to 1.5C, but not by just by pulling the same levers a little bit harder, because they are being pulled roughly as fast and as hard as we are currently imagining..."
Photo credit: "Reforestation is seen as essential if the world is to restrict warming to 1.5C, as outlined by the UN." Photograph: Otto Bathurst/Jon Arnold Images Ltd/Alamy. U.N Says Climate Genocide is Coming. But It's Worse Than That. We are on track for about 4C of warming. What would that look like? Here's a clip from New York Magazine: "...At two degrees, the melting of ice sheets will pass a tipping point of collapse, flooding dozens of the world’s major cities this century. At that amount of warming, it is estimated, global GDP, per capita, will be cut by 13 percent. Four hundred million more people will suffer from water scarcity, and even in the northern latitudes heat waves will kill thousands each summer. It will be worse in the planet’s equatorial band. In India, where many cities now numbering in the many millions would become unliveably hot, there would be 32 times as many extreme heat waves, each lasting five times as long and exposing, in total, 93 times more people. This is two degrees — practically speaking, our absolute best-case climate scenario. At three degrees, southern Europe will be in permanent drought. The average drought in Central America would last 19 months and in the Caribbean 21 months. In northern Africa, the figure is 60 months — five years..."
File image: Jeff Williams, NASA. Hellfire. Is this what our future, especially in the western USA, looks like? Here's an excerpt from The Guardian: "...Wildfire scientists bridle at the term “fire tornado”; they prefer “fire whirl”, but “fire whirl” seems inadequate to describe something that built its own weather system seven miles high. In 1978, meteorologist David Goens devised a classification system that placed fire whirls of this magnitude in the “fire storm” category, along with the caveat that: “This is a rare phenomenon and hopefully one that is so unlikely in the forest environment that it can be disregarded.” This was 40 years ago. So what has changed? For one, the addition of a new verb to the wildfire lexicon. “Natural fire never did this,” explained Gyves. “It shouldn’t moonscape.” But now it does..."
Photography credit by Tim Hussin. Nothing But Clippers - "Michael" By The Numbers - Milder November?